The Second Phase Review of the Design Studio took place this past November 19th. Students are preparing for their studio final presentations to take place in a couple of weeks from now. In in this review they aimed to present a draft of what will be explained in the course closure days to a critic jury panel. Students are working in the post-production phase of their studio projects for this Fall 2015 course. Just a couple of weeks to go! The exhibition is based on Georges Perec book on the understanding of the space around us. It tries to bring an understanding to how the spaces we interact with change the way we act, exist, move, think, and live. A collection of photographs by Xavier Miserachs that depicts the everyday life of residents in Barcelona through the history of the city. He focuses on the economic struggles, work, relationships, and celebrations to give an understanding of the changing culture over the years. The CCCB hosts 134 photos worthy of an ultimate prize in the 2015 edition of the World Press Photo Exhibition. Each of them is supposedly alive, shocking, and real. Film and Cook is a new concept of festival where it joins the passion for cinema and gastronomy. A showcase for cinematographic productions based on gastronomy that brings the high gastronomy over to general public and announces their protagonists. It offers gastronomic shows with innovation as its protagonist. The exhibition summarizes the work of one the most important figures in contemporary Italian photography. In addition, the museum by Zaha Hadid becomes its own exhibition by a thought provoking exterior and interior. An exhibition of work from artists interested in objects and images vehicled by advertising, television, cinema, and the internet. As well the building by Frank Gehry provides a different thought process of creating a second skin and forms. Peter Rabbit prints all over the world. The lecture focused on the future of the city of Barcelona in terms of construction, infrastructure, and main goals to achieve. Architect Sara Udina explained the ongoing projects of the city such as 22@, the Sagrera Railway Station, and the future connection of the Collserola Mountains back to the city. The past Tuesday Texas A&M, Clemson, Roger Williams took the final exam covering all our seminar visits that were instructed by Merce Berengue bringing a closer conclusion to the class. The week started with students constructing small models to start giving perspective of the overall aspect of their building individually as well with the context of La Escosesa. The task is to emphasize a main component of the project and visualize the scale of the building with the interior and exterior spaces. On Thursday all students presented their draft presentation posters to their professors in our first series of refinement towards the final presentations. The presentations consisted of boards explaining the concept of the project, the context of the site and city, relationships between buildings, technical drawings, and compilations of renders and elevations. Talking Galleries instigates the debate and exchange of new trends and issues specific to the art gallery sector. Open to gallerists and art professionals, the 4th Symposium will be celebrated in Barcelona (MACBA ‐ Museu d’Art Contemporani de Barcelona) on 2–3 November. Two days in which to create a space to reflect and question how galleries should transform and adapt to a new environment, and how to respond to new challenges. This Sunday, the Film Symphony Orchestra brings cinematography to the home of the Barcelona Symphony Orchestra, L’Auditori. Expect to hear performances of classics such as Star Trek, The Matrix, Missions Impossible and E.T. and more recent films like The Imitation Game and The Theory of Everything by this renowned orchestra comprised of over 70 musicians. This architecture event will take place in the Edward Building, which can be accessed from the front entrance of the architecture building at UCLAN opposite Granthams printers on Corporation street. The abhorrence of the modern world, expressed most explicitly in a comprehensive popular rejection of the Modernist city, stands testament to the object failure of the Modernist project to deliver its promised utopia. Mounting a Post-­‐Modern critique of this failure, as irony and as dejection, was itself equally fruitless and ultimately facile, offering far less, in terms of substance, than the Modernist project itself. Winner of the CTBUH 2015 Best Tall Building Worldwide Award: Bosco Verticale in Milan by Boeri Studio. Photo © Paolo Rosselli. Boeri Studio’s Bosco Verticale preserves the longtime architectural fantasy of building tall forest towers. Since the residential building was completed late last year, it continues to garner plenty of attention and awards. Most recently, the project won the 2015 Best Tall Building Worldwide from the Council on Tall Buildings and Urban Habitat. The announcement concludes a nearly yearlong juried selection process that began with 123 entries representing 33 countries. The exhibition in the Prague Municipal House is presenting a selection of the most outstanding works of Czech and European Art Nouveau art from the holdings of the Museum of Decorative Arts in Prague. The exhibition is intended to show the Art Nouveau arts and crafts as part of the ground-breaking, forward-looking trends and emancipation efforts that evolved in the late 19th century, as a reformist art movement that strove for “the multiplication and intensification of life”. The display will therefore explore the Art Nouveau aesthetic both in terms of modern artist designers’ creative ambitions and the new zest for life that swept society as a whole. Masterpieces of decorative art exhibited at the famous Paris World’s Fair of 1900 will be on display, alongside works influenced by the various currents of thought popular at the time (such as the theories of Vitalism and Spiritism), as well as the formal and stylistic innovations in glassware, ceramics and furniture. Other areas will cover the radical changes in life style as reflected in interior design, the visual style of poster art and fashion. The Short Film Festival Berlin is the second most significant international film festival in Berlin after the Berlinale and also the second oldest short film festival in Germany. For six days inNovember each year, it presents short and medium length films from all over the world in selected cinemas in Berlin. New York‐based Gregory Porter, the new international star of jazz singing, will open the 2015 edition of Roma Jazz Festival. Acclaimed over the last years by critics and audience for his baritone voice – an amazing blend of soul, gospel, blues and jazz, his performances evoke the charming atmosphere of music clubs in the Fifties. Until November 22nd 2015 the fascinating spaces of Palazzo Fortuny in Venice hosts Proportio, the exhibition organized by Axel and May Verboordt Foundation and the Fondazione Musei Civici di Venezia that explores the omnipresence of universal proportions in art, science, music and architecture. Proportio carries on the highly acclaimed exhibition project that has already presented a trilogy of exhibitions. Brilliantly reimagined by acclaimed director Julie Taymore, Disney’s beloved film has been transformed into a spectacular stage production that explodes with glorious colours, stunning effects and enchanting music. At its heart is the powerful and moving story of Simba ‐‐ the epic adventure of his journey from wide‐eyed cub to his destined role as King of the Pridelands. social event with high profile visitors such as Bono, Claudia Schiffer and Jools Holland helping to boost its reputation. But don’t worry if you don’t know your Art Deco from your Art Nouveau, the Fair is equally popular with new buyers looking to decorate their homes. Each year, over 20,000 visitors swarm to the fair with around 125 exhibitors offering everything from silver teapots and Lalique vases to Cartier earrings and from rubies to Regency furniture. When in Prague it was suggested to our group that we visit the “effiel tower of Prague.” Its official name is the Petřínská Rozhledna and it was built in 1891 and was used as an observation tower as well as a transmission tower. In 1889, members of the Club of Czech Tourists visited the world exposition in Paris and were inspired by the Eiffel Tower, which is w hy it was referred to us in that way. While visiting the tower people there to ld us, in 1953, a television broadcasting antenna was installed, and the prog ram feed performed by a directional radio antenna. This served as Prague’s main television signal provider until the opening of the Žižkov Television Tower in late 1992. Since I am studying architecture here it only made sense to go and see the Dancing House by Frank Ghery. While there, I found out that the very nontraditional design was very controversial at the time of it being built because the house stands out among the Baroque, Gothic and Art Nouveau buildings for which Prague is known for, and some thought that it contrasts too much with the normal architectural style. The Parliament Building was the building I enjoyed seeing the most in Budapest. It’s Gothic Revival style, was beautiful, especially when lit up at night and seeing the reflection on the river. It has a symmetrical façade and a central dome. The dome is Renaissance Revival architecture. Also inside the parliament building is symmetrical and has two absolutely identical parliament halls out of which one is used for the politics, the other one is used for guided tours. The inside of St. Stephen’s Basilica was breath taking. The church is named after Saint Stephen I of Hungary, the first King of Hungary. It is the third highest church in Hungary. The architectural style is Neo-­‐Classical, a Greek cross ground plan and the façade is anchored by two large bell towers. We got to go inside the dome by elevator or climbing 364 stairs and at the top you could see all of Budapest. During independent travel, I was priveleged to see the Pope on multiple occasions. However, seeing Pope Francis in the Vatican was one of the most surreal moments of my life. I have never seen one man’s presence demand such positive attention. It was incredible. Zaha demonstrated pure brilliance through the design of this museum. It’s fluid movement and rigid form contribute to a modern artistic environment. While, it is a beautiful work of architecture, it seriously lacks art within its exhibits, in my opinion. However, the building is such a joy to walk around. I now understand why no one is 100% sure how the Pantheon was built. It’s one of the most beautiful sights I have ever seen. It’s not that large of a building compared to other monumental buildings in Rome; however, it is so mesmerizing that I spent almost 3 hours in there. I completely lost track of time, getting lost in sketching and admiring the optical illusion that is the Pantheon’s dome. The Milan Cathedral was my final stop in my tour through Italy. This is easily the most beautiful cathedral I have seen. I had the priveledge of enjoying sunset on the upper terrace of the cathedral. I swear that terrace has the most beautiful views in all of Italy. After enjoying the beautiful views, I helped myself to some pizza and a little bit of gellato and called it a trip. 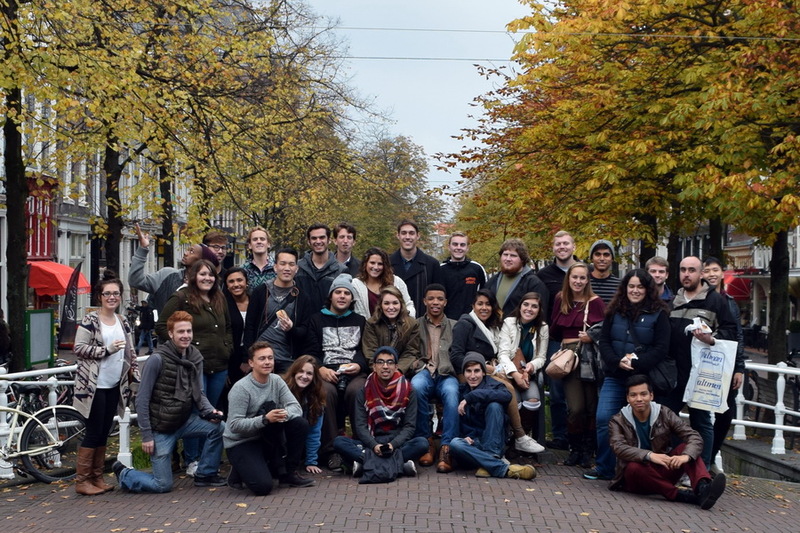 Fall 2015 students from Texas A&M, Clemson and Roger Williams University attended their second field studies trip to the Netherlands this past October. The visits where guided by Ivan Blasi and Anna Sala, both part of our BAC faculty team. The intense trip went through Rotterdam, The Hague, Hilversum, Delft, Zaandam, Utrecht and Amsterdam in a short 8 days. Students came back both impressed and energetic to continue the rest of this course! Thanks again to everyone who made part of this trip.